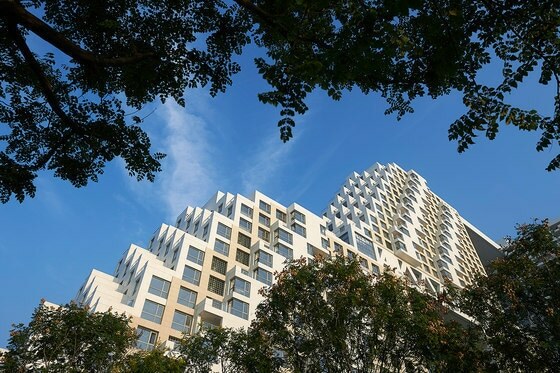 Safdie Architects recently marked the completion of Phase I of Habitat Golden Dream Bay and the launch of its second phase of construction. 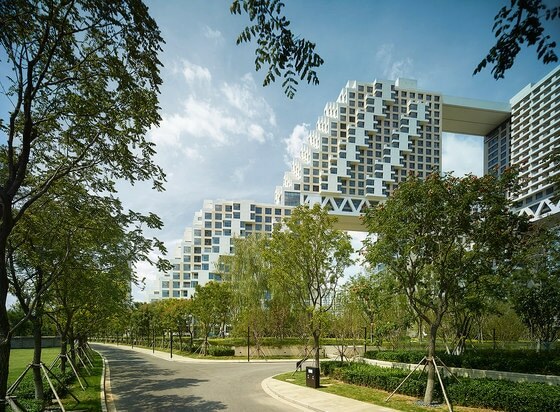 Located in Qinhuangdao, China on the coast of the Bohai Sea, some 200 miles east of Beijing, this high-density residential community o1ers a radical solution to a1ordable housing in today’s rapidly densifying urban centers. 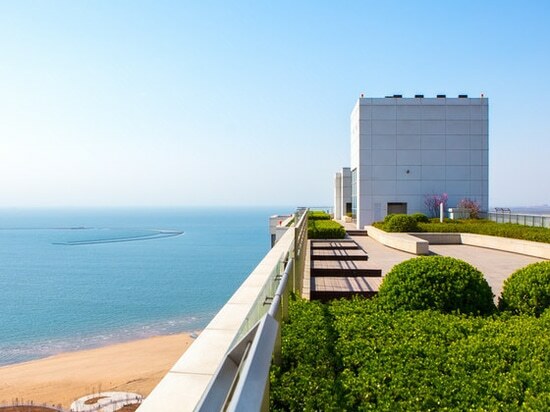 The 4,800,000-square-foot complex includes approximately 2,500 residential units, nearly 60,000 square feet of retail space, and villas along the beachfront. The second phase of construction adds three towers and two adjacent stepped buildings, as well as villas. 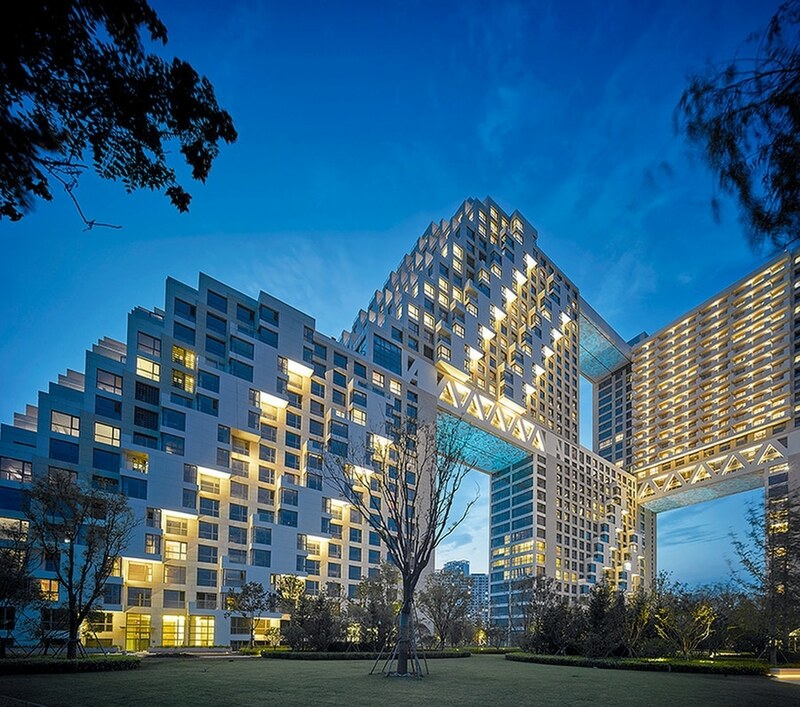 The 4rm’s design draws on its groundbreaking work in urban housing, beginning with Moshe Safdie’s design for Habitat ’67, created for the 1967 World’s Exposition in Montreal. Habitat explored a new way of conceiving high quality, a1ordable housing, combining the privacy of gardens, daylight, and views in individual units with an innovative modular structural system. 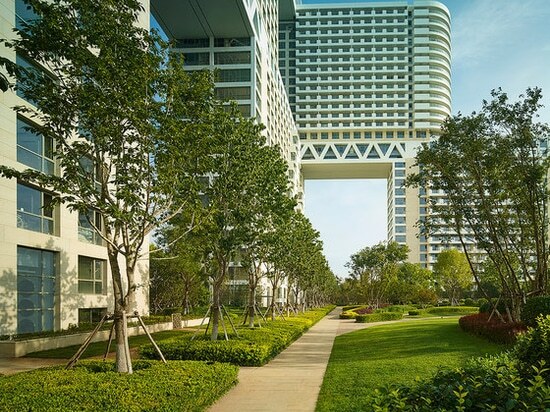 Exterior circulation systems such as internal communal streets and covered skywalks, together with landscaped terraces, combine to form a true three-dimensional community. 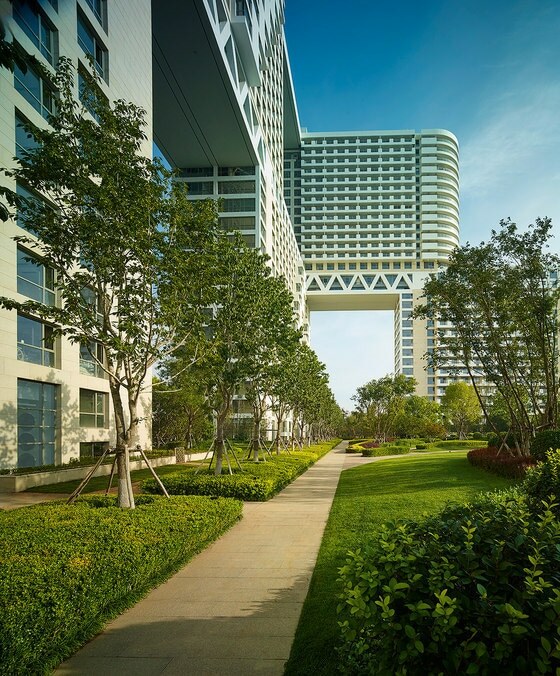 Safdie Architects’ design for Golden Dream Bay evolves this humanistic approach to meet the needs of the 21st-century city. 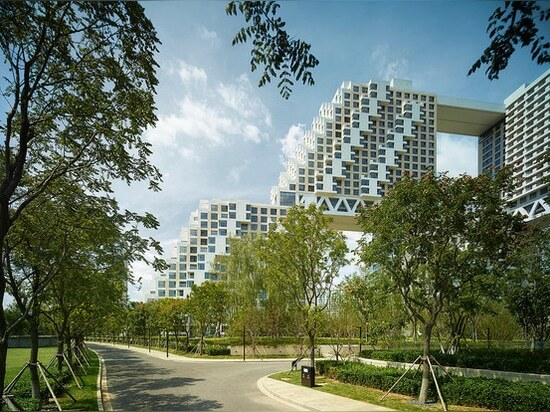 The complex consists of a series of individual 15-story slab buildings that connect and stack vertically, in two tiers, rising to 30 stories. The buildings are staggered, with units arranged in a stepped pattern, which results in a porous structure. The slab blocks are stacked, with large openings that a1ord views to the ocean and back to the city. 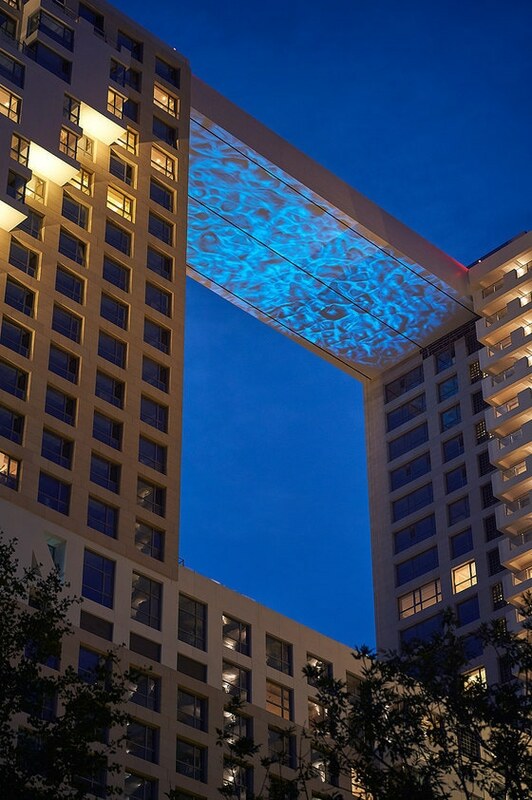 This stacking creates skyways at the 16th and 30th levels. 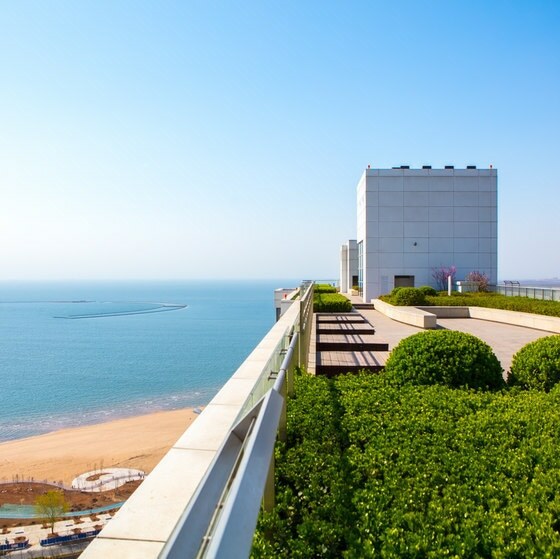 Each unit has maximum exposure, and a majority of apartments contain terraces and gardens. 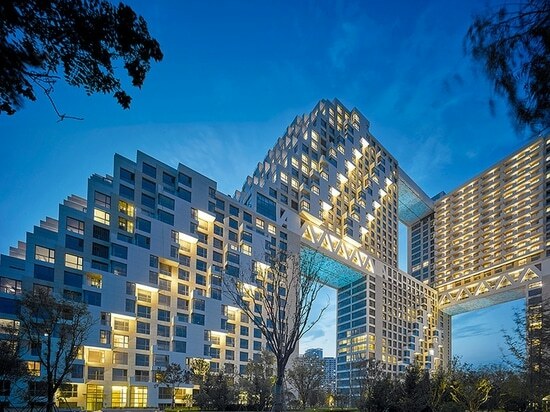 “The demand for quality, a1ordable housing in Asia’s growing cities has allowed us to apply the principles that informed Habitat ’67 on a grand scale,” said Moshe Safdie. Golden Dream Bay responds to the beachfront site and local zoning ordinance that requires every unit receive at least three hours of sunlight daily, measured at the low point of the winter solstice. 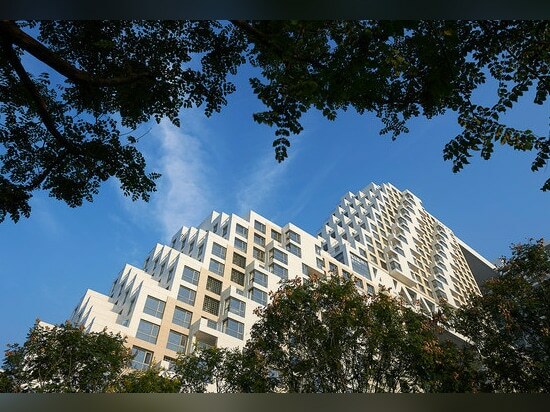 By siting the tower blocks north-south, together with the stepped pro4le, the solution maximizes construction e5ciency, and maintains the bene4ts of the individual dwelling with terraces, skylights, and solariums. 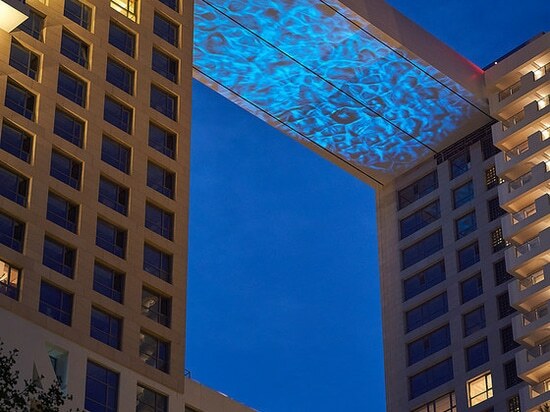 Units are connected through skystreets, forging a sense of community not possible in today’s supertall high-rises. 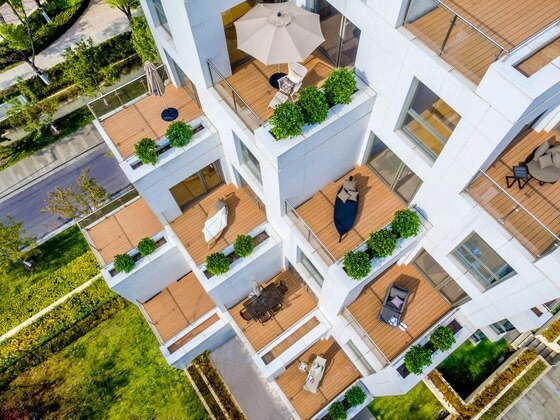 The complex is punctuated with a series of private greenspaces, terraces, and roof decks, inspired by Habitat ‘67’s tenet of “for everyone a garden.” Phase II of the project adds a spine of 4-story low-rise villas running east-west along the beachfront, with an area of over 538,000 square feet. Two point towers, at a height of 328 feet, form the eastern edge of the site. Two additional 328-foot towers at the eastern entrance to the site 4ll in the next phase of the masterplan, while maintaining relative building density and open space. The practice of humanizing the megascale—maintaining basic human necessities that are lost in most urban designs—has informed Safdie Architects’ work since the 4rm’s inception. In 2010, Safdie Architects won a competitive bid to design Golden Dream Bay, around the time the 4rm was reassessing Habitat ’67 and the e5cacy of its design. This resulted in Habitat of the Future, the culmination of two years of research around the design’s concept, which was featured in the traveling exhibition Global Citizen: The Architecture of Moshe Safdie. As part of the study, the 4rm produced architectural models to apply the Habitat concept to di1erent densities, environments, and economic structures. 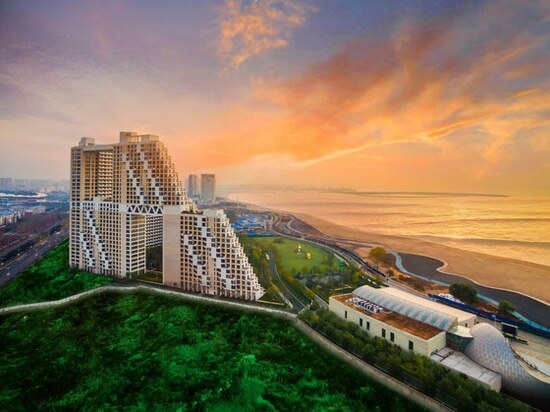 In addition to informing its design for Golden Dream Bay, these 4ndings were also applied to SkyHabitat, the 38-story residential complex in Bishan, Singapore, which breaks down the scale of a singular tower residential development to create a three-dimensional matrix of homes with private terraces, balconies, and common gardens.